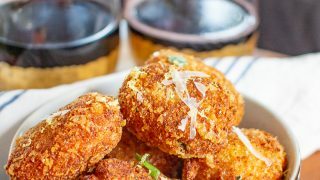 These easy to make Italian Croquettes takes a traditional Spanish tapa and adds Italian ingredients. 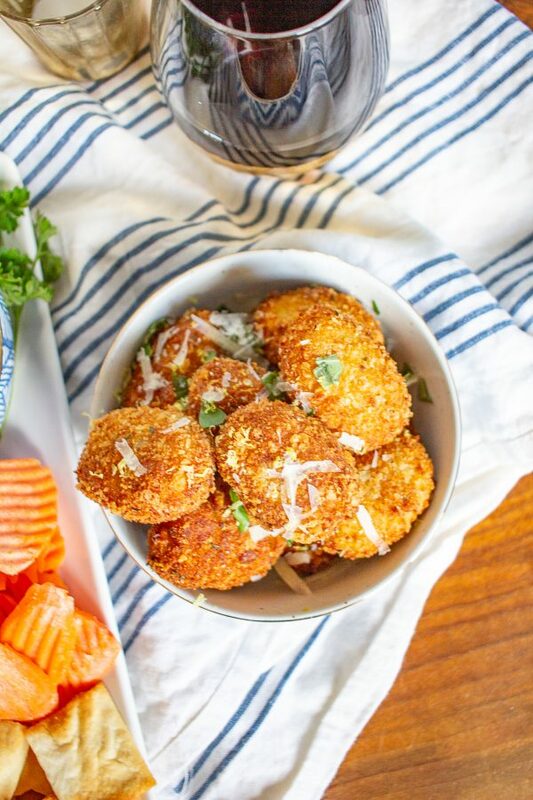 Serve Italian Croquettes as a snack or an appetizer … you won’t be able to stop eating them. We ate this entire batch between the two of us. When Charles and I were in Spain last year, we ate a lot of croquettes. As people who live in the Midwest, I think we love any food that involves both cheese and deep frying. 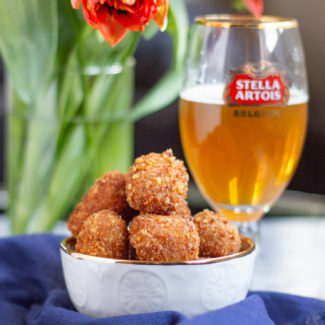 Plus, croquettes are the ultimate happy hour snack! 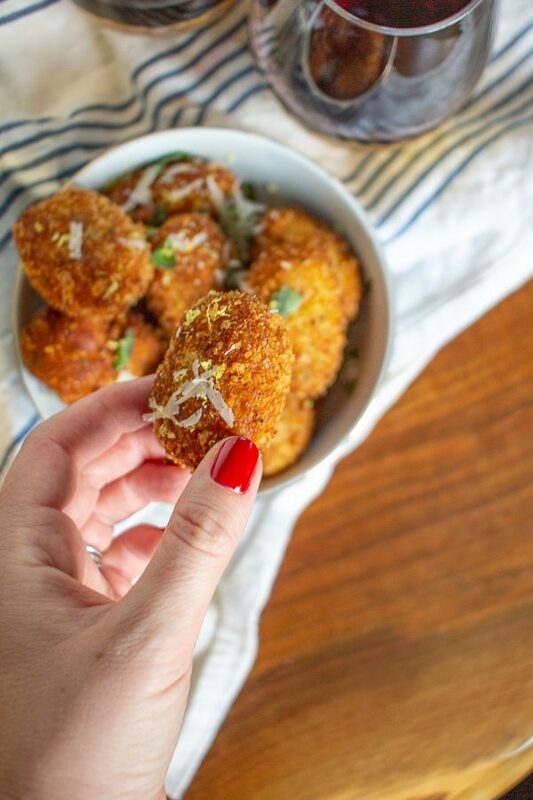 After our trip, I learned how to make traditional Spanish Croquettes with iberico ham and manchego, and it made me curious to try making Italian Croquettes with prosciutto and parmesan. In addition to the prosciutto and parmesan, I seasoned the filling with some basil and lemon zest. 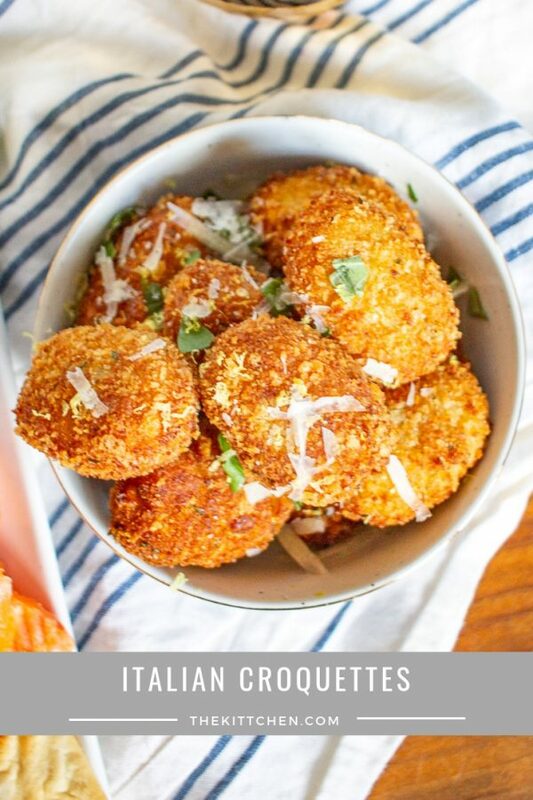 The basil and lemon added bright fresh flavors to this recipe, and makes these croquettes extra special. 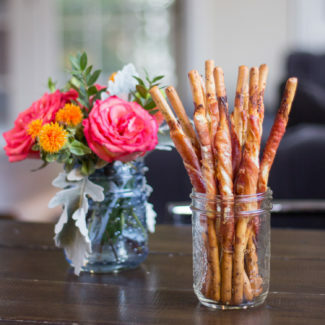 I love the crispy crunchy cheese and breadcrumb crust, and the cheesy meaty prosciutto parmesan filling. 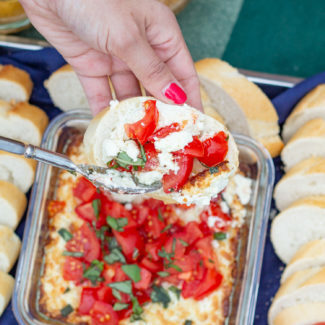 It is a satisfying savory snack, and it is a great more-filling appetizer to serve at a party. This recipe makes about 16 Italian Croquettes with a heaping tablespoon of the croquette filling. 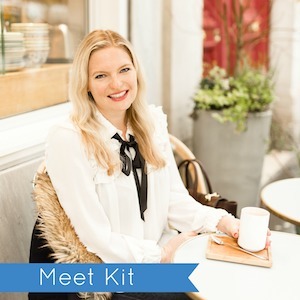 You could opt to make smaller bite-size croquettes – it is totally up to you! Croquettes are surprisingly easy to prepare! You start by mixing up everything on the stovetop. Then you let that meat and cheese mixture chill in the fridge for about an hour. The chill time is really important because chilling the croquettes gets the filling to stop being sticky. Then you take the chilled filling and roll it up and add the breading. The last step is deep frying. I very rarely deep fry anything, this recipe is one of my favorite indulgences. 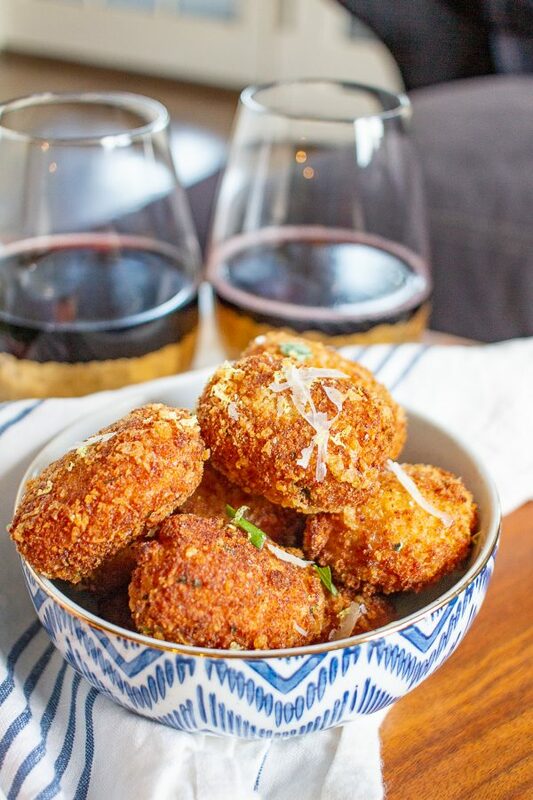 You can prepare these croquettes up to an hour in advance. Just deep fry them and then place them in the oven on a low temperature so that they will keep warm. 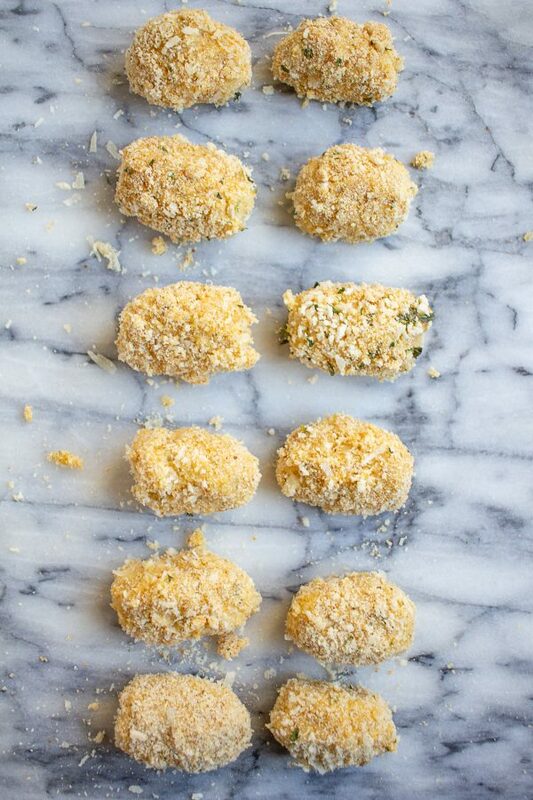 Serve these croquettes on their own, or serve them along with some marinara dipping sauce. Heat the butter and olive oil in a saucepan or skillet over medium heat. Once the butter melts, add the shallot and season with salt and pepper. Once the shallot is translucent, add the flour and stir, letting the flour cook for 1 minute. Next, whisk in the milk. Continue whisking until the flour is not longer clumpy. Continue to whisk, letting the mixture cook for 3 minutes, it will get very thick. 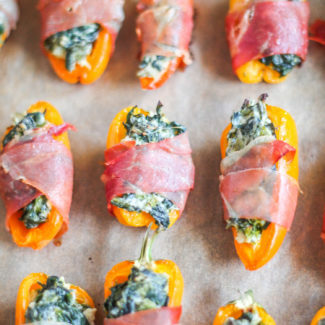 Add 1/3 cup of cheese, chopped prosciutto, basil, and lemon zest and stir to combine. Let this mixture cool in the fridge until it is cool enough to handle. 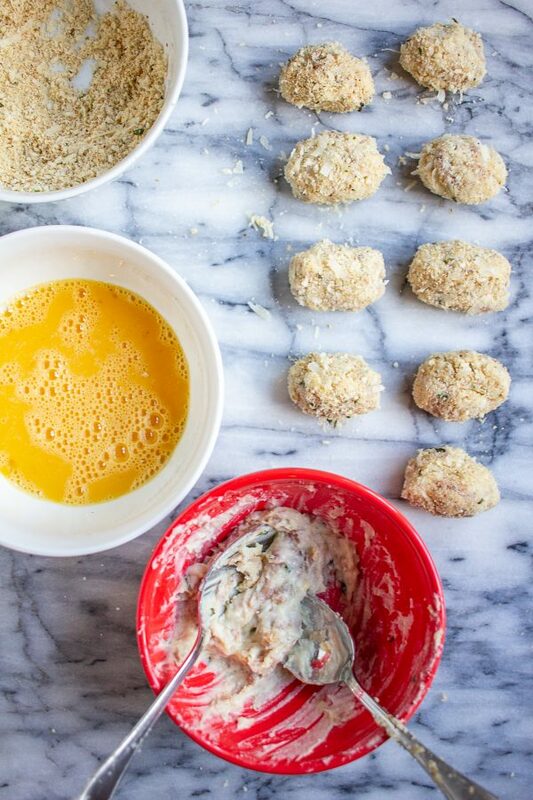 To form the croquettes, scoop up a tablespoon of the mixture and then form into an oval. Continue using all of the dough and making about 16 croquettes. Crack the eggs into a bowl and whisk. 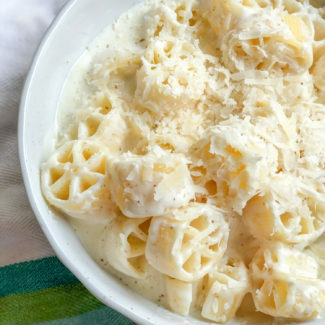 Combine the panko, breadcrumbs, and remaining cheese in another bowl. One by one, roll the croquettes in the breadcrumb mixture, then the egg, and then back in the breadcrumb mixture. Place on a plate. Heat 2-3 inches of vegetables oil in a heavy saucepan, until it reaches 375 degrees. Once the oil is hot, carefully lower the croquettes into the oil, cooking 3-4 at a time. Let them cook for about 1-2 minutes, until golden brown, and then remove from the oil with a slotted spoon and place on a paper towel to absorb any excess oil. 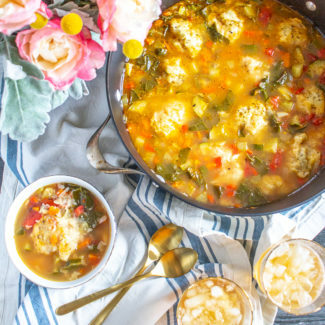 Serve immediately or keep warm in the oven until serving (I set the oven to 250 degrees).